Masses of residents have put forward their ideas on how to save their local waste centre saying SOS- Save Our Skip. 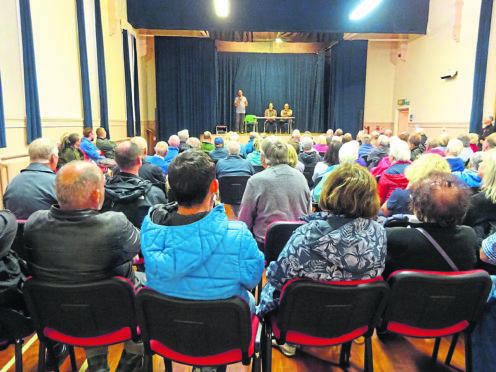 Residents of Portsoy and the surrounding area turned out in large numbers to discuss Aberdeenshire Council’s proposal to scrap their waste facility. Over 120 people were at this week’s meeting to make suggestions on how to better use the facility in a bid to stop its closure. Ideas ranged from promoting the centre and setting up a buddy scheme to ensure the elderly can access the site and provide better education about what can be recycled. Council proposals include changing the amount of non-recyclable waste collected at the kerbside, closing smaller sites and improving larger recycling facilities and changing the current bin system to reduce waste capacity. Portsoy residents at the meeting, however, highlighted their concerns with the council’s plan, including increased fly-tipping, the distance to the next nearest site, the CO2 increase for traveling to that skip and anomalies within the council’s waste strategy consultation. Treasurer of the Portsoy and District Community Council Christopher McKay said: “No one has said it is a good idea, therefore it’s a bad idea. “There’s over 120 people here and we’ve a population of 1800 – what other issue is going to get that sort of turn out? “I think it will lead to a decrease in recycling. Locals also spoke about the local nursery’s trips to the facility to learn about recycling and the staff involvement in educating the young as worries spread that children would fall out of recycling habits. Chairwoman of Cornhill and Ordiquhill Community Council Julia Swallow said: “This is the centre we come to. Everyone puts their rubbish here. Rod Lovie, a member of the Portsoy Community Council who spoke at the meeting, compiled the statistics of each recycling centre’s tonnage to illustrate that Portsoy was almost as busy as larger sites. He said the community – which runs the local gym, museum, Salmon Bothy and camp site – would happily work to increase the recycling rate even further to prevent the centre’s closure. An Aberdeenshire Council spokeswoman said they continued to seek residents’ views on the new waste strategy. She said: “Proposals do include improving the network of recycling centres, meaning equal and fair access for all Aberdeenshire residents at no extra cost. That would mean shutting some smaller facilities. “We are very interested in what residents think about these proposals, aimed at increasing the area’s recycling rate, and encourage people to participate in our consultation and give their views. The consultation will appear before the Banff and Buchan Area Committee on Tuesday.